Trans Dapt 6077 - Valve Cover PCV Grommet Inside Diameter: 3/4"
Trans Dapt 4998 - Valve Cover PCV Grommet Inside Diameter: 3/4"
Trans Dapt 9760 - Ford PCV Valve Cover Grommet Inside Diameter: 3/4"
Molded from neoprene to ensure a positive oil seal. 1-1/4'' diameter plugs or grommets fit most stamped or die cast valve covers. 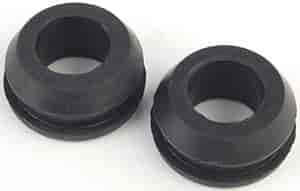 #720-6376 includes one breather grommet and one PCV grommet. 2/pkg.